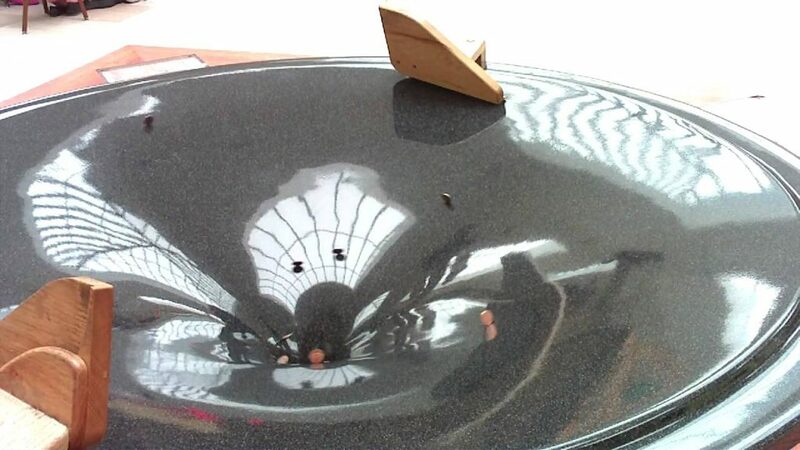 Do you remember those old games they used to have in arcades and the occasional chip shop, where you’d drop your loose change through a slot and it would spiral in, drawing closer and closer to the gaping hole at the centre? Imagine for a moment the same game, but now in pitch black. The slope is completely invisible. The only light comes from the coins themselves, which are phosphorescing as they roll. If you watched them for long enough, watched them arcing and diving towards the center, could you infer the shape of the slope? Basic physics says that you could, their motions are a cocktail of simple forces. Given enough coins and enough time spent watching, you would find only a single form of the slope could explain all the paths they’ve traced. Most of the mass of our galaxy is in the form of a huge, smooth cloud of dark matter, material that interacts through gravity but which neither emits nor absorbs light. Much like an elusive room-mate, who’s presence is only felt through the growing pile of dishes in the sink, it’s mystery comes from our inability to see it. When stars orbit our galaxy, they’re feeling the gravitational pull of the Milky Way’s stars and gas, and from this huge mass of dark matter. Depending on how this dark matter’s distributed the orbits will be different. If we watched the stars for long enough we could work out the exact form of the cloud around our galaxy. In doing so we might also glean some key insight into the form of the particles that make up dark matter too. There’s only one problem. Whilst a coin on a slope may make it’s way round in a matter of seconds, a star around our milky way may take as long to orbit as terrestrial life has existed. And I for one don’t have that amount of time to kill just watching stars go in circles ellipses. So we’re going to have to find a more immediate way of tracing the shape of the galaxy. Let’s return to our chip shop for a moment. Imagine we had the same restriction, rather than watching it all afternoon (which I’m pretty sure is what got me interested in science as a child), we only get to look at it for a moment. If all the coins were released at different times and from different places this would be almost useless. But what if two coins were released at the same time, directly next to each other. They’d travel almost exactly the same path, but the one incrementally closer to the hole, on the steeper slope, will move just a tiny bit faster. Over time they start to separate, just a fraction, but enough that we could see. At any moment, the amount they’ve diverged depends on the path they’ve taken, and if we can work out how they’re spreading, we can work out on what slope they’re travelling. The same thing happens when smaller galaxies come to close to our own. The cloud of stars starts to slowly diverge, each on a slightly different orbit. They spread out, tracing a long, trailing path. We call this a stream, we see them in our own galaxy and others, and they’re the key to mapping the dark matter around us. 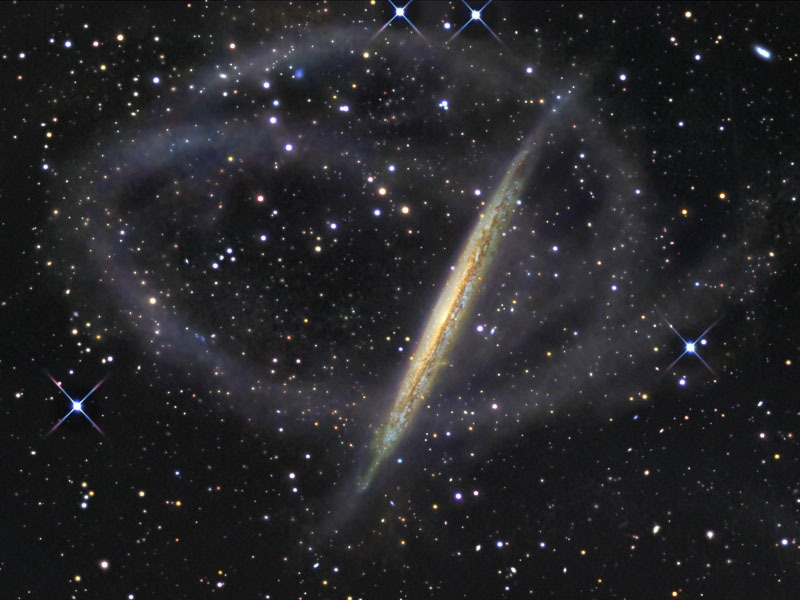 Here we see a galaxy (NGC 5907) from the side. Wrapping around it is this long, faint trail. This is a stream of stars, pulled from a rapidly disintegrating orbiting galaxy. 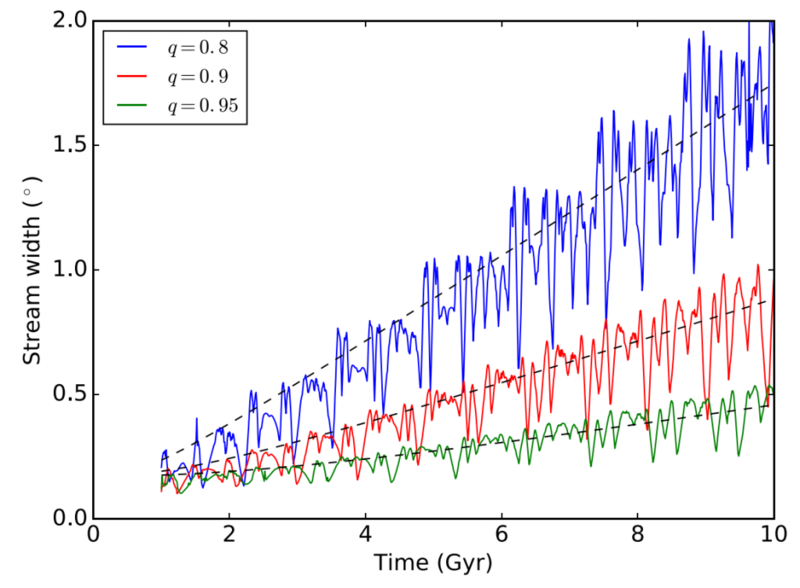 Based on the length, width, and, for the first time in this paper, breadth of the streams we can infer the shape of the gravitational well we sit in. Of particular interest is whether the dark matter surrounding us is a simple sphere, disky like the stars and gas of our galaxy, or whether it’s all gone pear shaped. If the dark matter forms no perfect geometric object then streams may be much more spread out. Whilst we expect it to be close to spherical there may be small but significant amounts of squishing and stretching in different directions. As our observations of these streams improve, we’ll find tighter and tighter constraints on the way dark matter distributes itself around us. If the streams are thick, and our gravitational potential well elongated, it will raise fundamental questions about dark matter and how it interacts with itself and our galaxy. This article is in no way affiliated with Peter’s Fish Factory. Any references to Peter’s Fish Factory are completely coincidental. I’ve never even heard of Peter’s Fish Factory and resent any implications to the contrary. Delightful bite. Thanks. Made me homesick for proper fish and chips…. For those who can get to it, Peter’s Fish Factory, it seems, is not a figment of Zephyr’s imagination. Nice post. 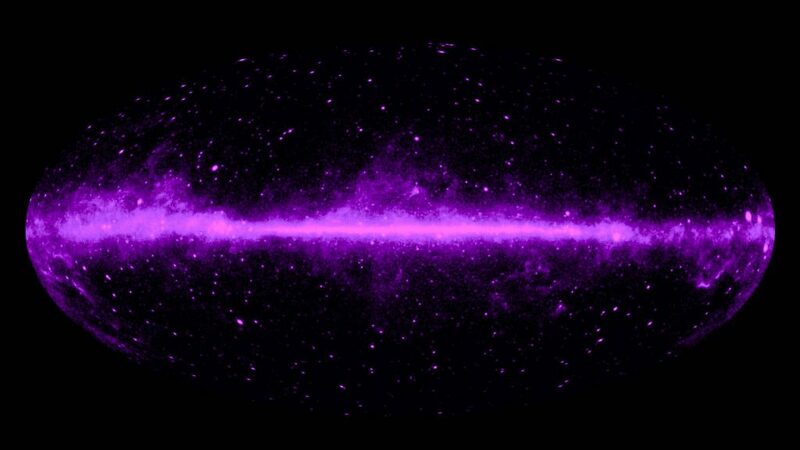 To clarify the second figure, it is not a hypothetical image of dark matter, but an image of the sky as seen in gamma-rays. Some dark matter models predict that annihilating or decaying dark matter might contribute a small fraction of these observed gamma-rays. Maps like this have already succeeded in ruling out many such particle physics models.